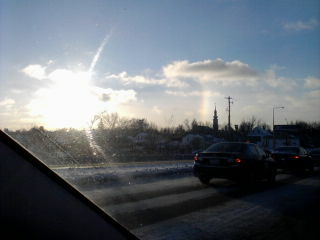 I think you can see the ice rainbow in this picture. It's right there by the church spire. It's really, REALLY cold out today. In other news, my parents, who are snow birding in Texas right now, would probably be extremely gratified to know that the temperatures are, once again, in the why-do-you-idiots-live-here range. I believe the windchill this morning was -36 F. The actual outside temp was something in the range of -15. The only really nifty thing about weather like this is the ice rainbow halo around the sun. The moisture and pollution particles in the air actually freeze, and are, thus, apparently, wonderful little prisms. So driving Mason to school this morning, I could see a perfect rainbow halo around the hazy sun. It was kind of cool, but from peronal experience, I also know that when you can see an ice halo/rainbow around the sun the roads are insanely unsafe. Think about it: if air freezes, so does exhaust. Black ice is everywhere. I heard about at least three roll overs on the highway this morning. Even the side streets were super-slippery. Okay, that's all I know. Stay warm, kids!